For courses in Word Study / Introduction to Reading Education. Learn how to develop a child’s word knowledge and understand its relationship to reading, writing, spelling, and vocabulary. Words Their Way® for Parents, Tutors, and School Volunteers is designed to provide friendly instruction in phonics, spelling, reading, writing, and vocabulary development. In this book, the authors describe the five stages of literacy development and how they are interconnected, while also offering a host of fun and purposeful activities. 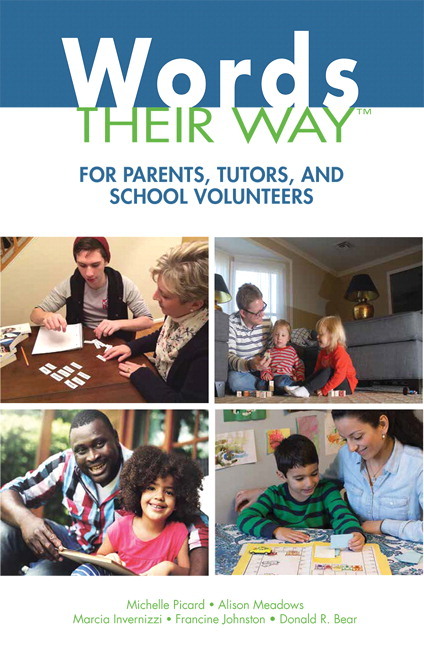 Step-by-step guidance is provided for teaching the essentials of word study including stage-specific explanations of what each parent, tutor, school volunteer, and child needs to know about how sound, pattern, and meaning work in words. The authors also include numerous writing and spelling samples, frequently asked questions, book lists, activities, and guidance on how to talk to children about spelling and its relationship to reading and writing. This book is an ideal companion to Words Their Way®: Word Study for Phonics, Vocabulary, and Spelling Instruction. Flexible and packed with invaluable teaching and learning aids, this is the ideal supplement to the highly popular Words Their Way®: Word Study for Phonics, Vocabulary, and Spelling Instruction. The book is designed with a flexible structure so that the chapters may be read in any order, allowing users to personalize their learning experience. Chapter 2, Word Study Basics, shares what a developmental word study program looks like in the school setting, and includes step-by-step guidance for essential word study techniques for the classroom and at home. Word Study With Parents, Tutors, and School Volunteers sections include fun and purposeful activities specific to the child or young person’s stage of development. Let’s Talk About It sections present stage-specific descriptions of how to talk to children about words and how they work. Sort Support sections include stage-specific descriptions of the phonics, orthography, and morphology that need to be acquired to be successful in each stage of development. Authentic student writing and spelling samples are included in each chapter to give readers real examples that bring the concepts to life. Frequently Asked Questions about Word Study and Literacy,Chapter 8, includes 26 common questions parents and teachers ask with succinct, direct responses from the authors. Chapter 1: What is Word Study and Why Is It Important? Michelle Picard is the K-12 supervisor of English Language Arts in Arlington Public Schools in Virginia. She holds both a Masters and Doctoral degree from the University of Virginia focused on literacy education, research, and leadership. She spent over a decade teaching elementary and middle school followed by positions as a K-12 Literacy Specialist, Director of Early Childhood and Elementary Education, adjunct professor, and director of a summer graduate reading clinic. Her background and interests focus on word knowledge and its relationship to reading, writing, and spelling, literacy development K-12, intervention, and children’s and adolescent literature. She authored the 2011 CODiE award winning professional learning course Words Their Way Online. Alison Meadows is the assistant principal of Lyles-Crouch Traditional Academy in Alexandria City Public Schools in Virginia. Alison is a former second grade teacher, special education teacher, and reading specialist. She has also served as an adjunct professor for the Curry School of Education at the University of Virginia and continues to work with schools as a literacy consultant. Her background and interests focus on literacy development, developmental spelling, reading intervention, and professional learning for educators. Francine Johnston is retired from the Department of Teacher Education at the University of North Carolina at Greensboro where she served as Director of Graduate Studies, Coordinator of the Reading Masters Program, and ran a clinic for struggling readers. Francine worked as a first grade teacher and reading specialist for 12 years before getting her doctorate at the University of Virginia where she first learned about a developmental approach to word study and worked with Dr. Marcia Invernizzi to develop word study materials and activities. She consults with school districts across the country and frequently serves as a professional development speaker.